Testing the stiffness of tripods has been a long time coming, and I am finally getting around to it. Up until now, I have been reporting the stiffness of tripods at their maximum height. This is the most natural approach, and most people are going to use their tripod at maximum leg extension most of the time. However, there are some very notably exceptions. Some tripods such as the Really Right Stuff TVC-33, come in a ‘long’ version, in this case, is the TVC-34L. The TVC-34L extends to 68.8 inches, placing the camera far overhead for most people. The tripod will thus be used most of the time in a somewhat retracted position. This stiffness vs height test is also a necessary step towards building a framework to compare tripods of different heights. We want to be able to compare two tripods by approximating the stiffness that the taller of the two would be, if it were set at the same height as the shorter one. This will require having a simple mathematical model for tripod stiffness vs height. Once we have such a model, I will also apply it to creating a more realistic score metric for tripods. Currently, I simply take the stiffness x height / weight to create an approximate score to rank tripods by. I don’t believe that this metric adequately rewards taller tripods compared to shorter ones. where is the stiffness, is a normalization constant corresponding to , is the height, and is some exponent. The fitted parameters will thus be and , with being the primary one of interest. Most beam deflection formulas follow this structure, and it is thus reasonable to expect a tripod, whose stiffness is based on the rigidity of beams, to behave similarly. The model is far from perfect though, most notably because the stiffness of the ‘beam’ in question, the tripod legs and apex, varies significantly along its length. The upper leg sections are vastly more stiff than the lower ones, and the leg locks will also reduce the stiffness at specific points along the length. where is the stiffness of the all of the stuff at the top of the tripod that does not change with the height. We can see that this is simply the addition of a constant stiffness factor to the power law model above, added in the usual way for springs in series. If is infinite, this reverts back to the power law model. For this first test, I used a Manfrotto MT055XPRO3. This is an ideal candidate because it has low damping, making the stiffness measurements more reliable. It is decently tall, so I can test a significant range of height. Finally, it is not so stiff that I will have trouble measuring the stiffness at lower heights. Note that I am using leg length instead of tripod height as my x-axis. This helps isolate the effect of the legs on stiffness. The tripod height is simply a percentage of the leg length, plus a small amount of the center column stack. In practice, it matters very little which factor I used to fit the data, as they gave very similar results. The green (simple power law) fit diverges from the data at the ends of the data series. The fit for the power law with apex correction is so much better, that I will only be discussing it from here on out. 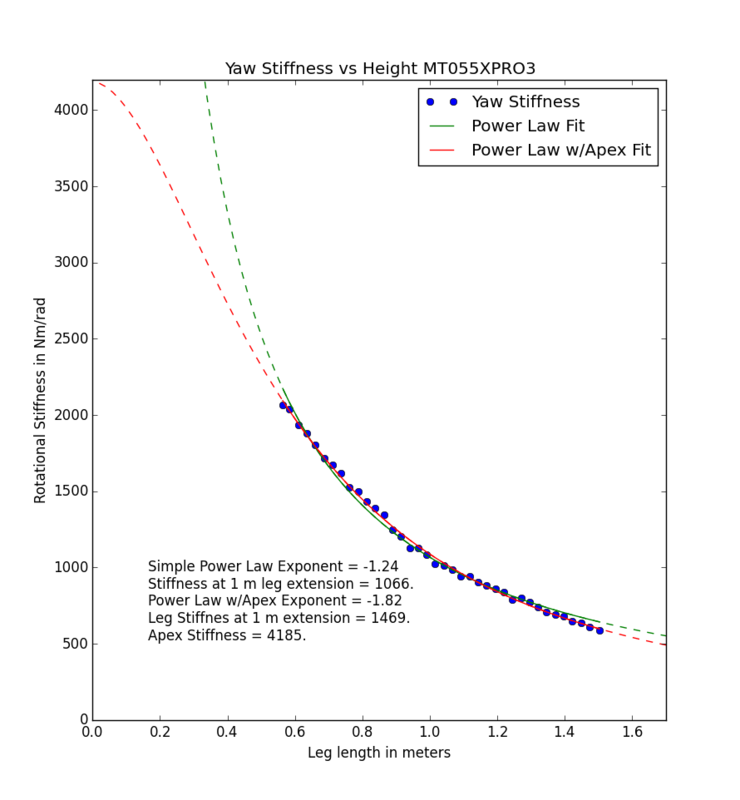 The fitted apex stiffness of 4185 Nm/rad is a very reasonably quantity. That is the same stiffness as quality ball heads, and stiff enough that it will feel completely rigid to the hand. The flexibility of the tripod is therefore dominated by the legs when they are at full extension. 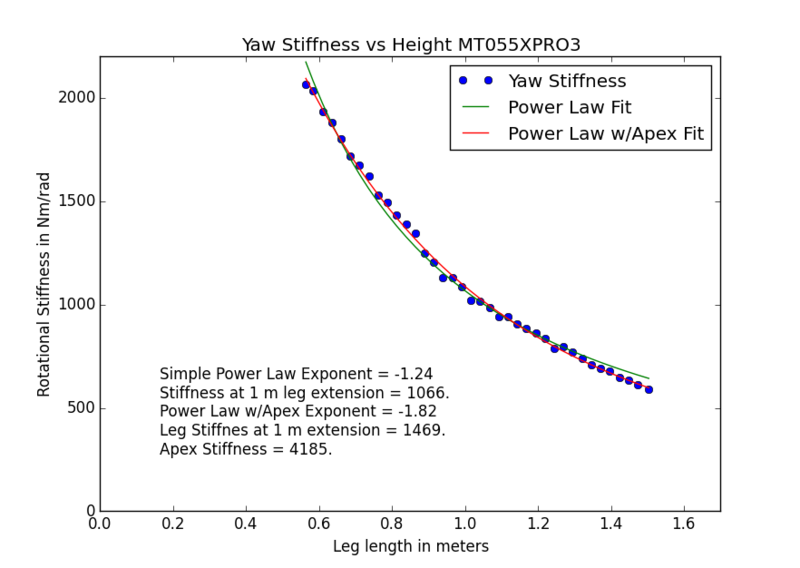 The exponent for the power law on the legs was fit to be -1.82. I don’t have a lot of context for interpreting this number at the moment, except that it is close to -2. So, the legs are roughly four times as stiff when at half their height. But, as the stiffness of the legs increases, the more that the flexibility of the apex begins to matter, so the tripod as a whole is not four times as stiff. I need to test the stiffness vs height for a number of other tripods to know if this exponent is consistent among different models. However, due to the nature of the data, we should have less confidence in the fit parameters. In the yaw direction, we successfully captured a noticeable curve. Here, the data looks pretty linear, and the range of parameters that can make a reasonable looking fit to the data is larger. Taking the data at face value though, the flexibility of the apex plays a much larger role for the pitch direction. There is a very clear upward trend in the damping as the tripod gets shorter. It has to get a lot shorter before it begins changing significantly though. Don’t expect to drop the height a couple inches and expect the damping to noticeably improve. I don’t have a model for how I expect the damping to behave, but the raw data is still informative. The MT055XPRO3 tested here only has three leg sections, limiting the range of possible heights. What does the data look like for a four or five section tripod, and can I distinguish more clearly between the two models? If I run a similar test on the very similar carbon fiber MT055CXPRO3, will I fit the same value for the apex stiffness? Both tripods share identical hardware for the apex, and so it should be the same. This would help establish the validity of the model. What kind of exponent do other tripods exhibit when adjusting the height? 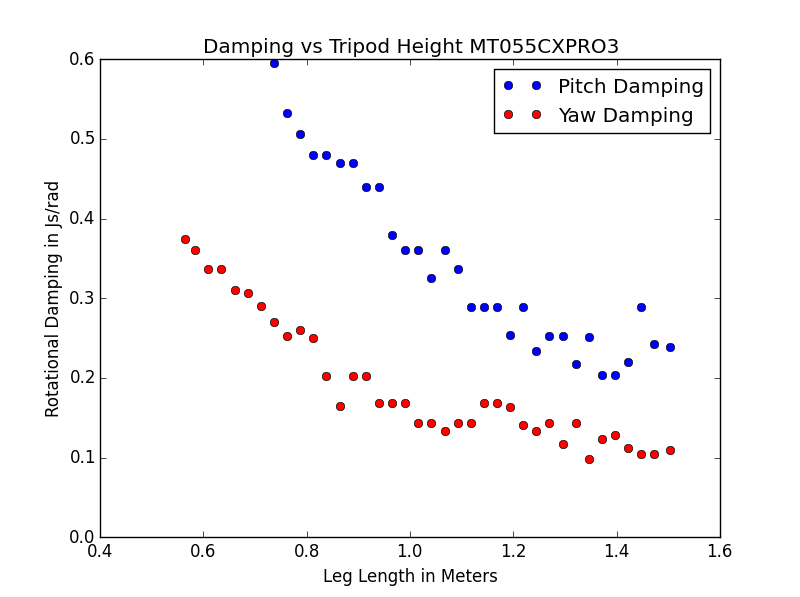 What kind of apex stiffness is observed for tripods that have no center column? 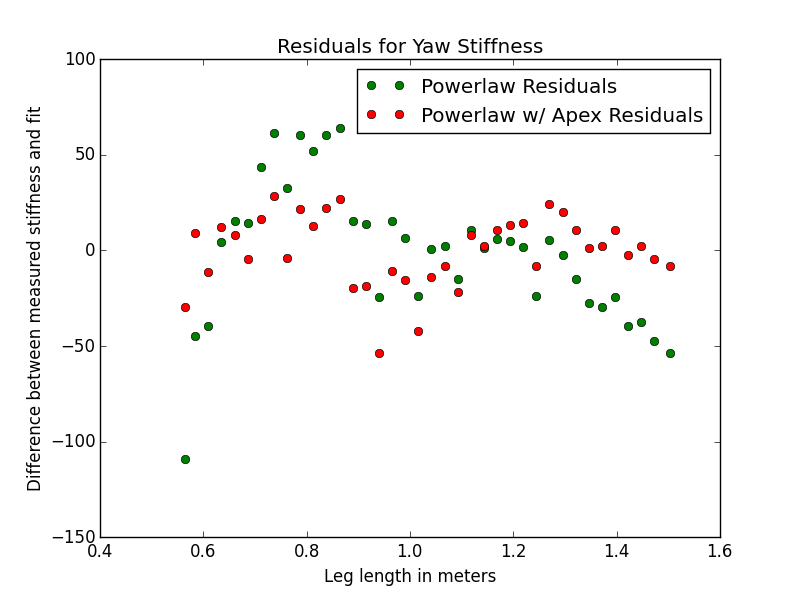 Does the mere presence of the center column affect stiffness? Unfortunately, carrying out this test of stiffness vs height was incredibly time consuming, and I simply cannot repeat it and add it to the test results for every single tripod. It is illuminating enough data though that I will be repeating on a variety of different (and similar) tripods to extract their secrets. In the future I will be speeding up the data acquisition process by taking fewer data points and possibly ignoring pitch and damping data. I was hoping to be able to use a power law to extract a simple metric to compare tripods with each other after only measuring the stiffness at maximum height. 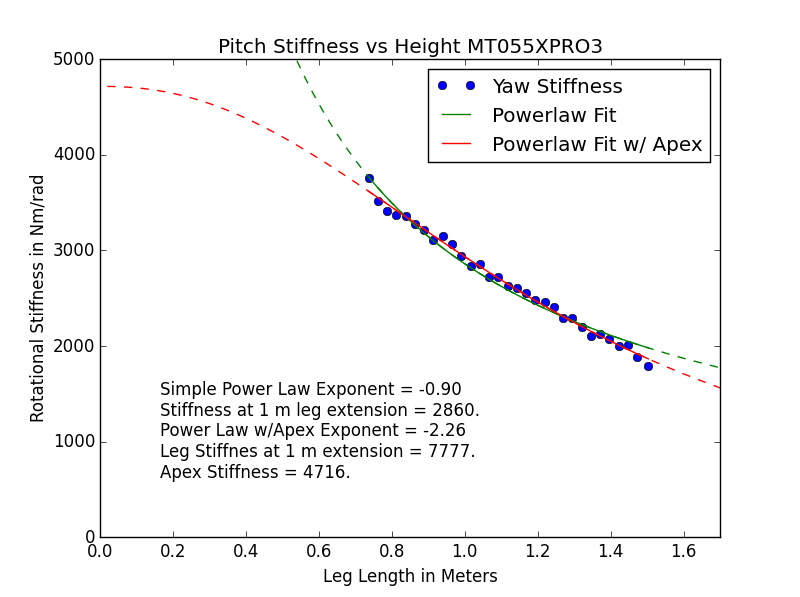 Since it appears that the apex stiffness plays a significant role, this is not possible. To get a perfectly consistent score metric, I would need to do a stiffness vs height test for every tripod. I may still choose an exponent metric different from the -1 I currently use, but it will require a lot more careful consideration, and sure won’t be perfect. or the thinnest one first, or the fattest one first, or something else? Good question, I forgot to add that detail. I retracted the thinnest legs first, as I expect this maximizes stiffness. have inflection points that perhaps correspond to the particular leg section being retracted. That’s fair. But it is the most stable way to use a tripod in lab conditions. The results wouldn’t be that different if I had retracted a different leg section first. specific equipment for doing so? Yes, I physically measure the stiffness of each tripod tested, or in this case, at each height. I have some custom equipment I built for this purpose, check the ‘Methodology’ tab on the site for all the glory details. In short, I put a large bar on the tripod and force it to vibrate. The stiffness can then be very accurately calculated from the vibration frequency.